After you update all the requirements in the input sheet of the Exchange Server Role Requirements Calculator, the calculator generates result sheets containing detailed configuration and architecture information. This document describes each result pane. Environment Configuration — see “Environment Configuration” below. Server Configuration — see “Server Configuration”. Log, Disk Space, and IO Requirements — see “Log, Disk Space, and IO Requirements”. The Environment Configuration section (see sample in Figure 1) can include some or all of the following information, depending on how the input sheets were filled in. Process Core Ratio Requirements Recommends the number of Active Directory global catalog core processors, with the minimum number of core processors at each datacenter for handling the load for the designed users. Client Access Server Requirements Recommends the minimum number of client access server core processors and random-access memory (RAM) configuration for each server at each datacenter. If the design requires multi-role servers, these fields are blank because there is no dedicated client access server (CAS) in the environment. Environment Configuration Requirements Provides environmental information such as the minimum number of dedicated CAS devices, active mailbox database copies at each datacenter, number of database availability groups (DAGs) in the environment, total number of servers in each DAG and lagged copy server details. Total user mailboxes in the environment. Total number of mailboxes per database, with their mailbox size. Read/write ratio per mailbox (percentage of read and write operations on the mailbox). Database Copy Configuration Total number of database copies in each server, each DAG, and in the total environment. Database Copy Instance Configuration Number of high-availability (HA) database copies and lagged database copies in each datacenter, with the total number of database copies in the DAG. Database Configuration Information about the number of databases in the DAG to accommodate the user base, with the recommended number of mailboxes in each database and the available database cache memory/mailbox. 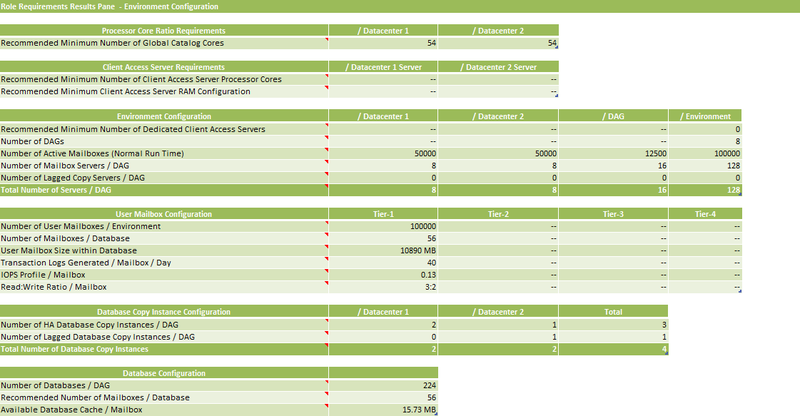 The Server Configuration section (see sample in Figure 2) shows hardware specification recommendations. It contains information about RAM, process cores with their expected utilization, and the recommended store architecture for the Mailbox server. This pane is organized into Transaction Log Requirements, Disk Space Requirements, and Host IO and Throughput Requirements (see sample in Figure 3). Transaction log shows the number of transaction logs generated daily for each database, server, DAG, and the environment. Disk storage refers to the disk capacity required for the database and logs. Host IOs refers to the expected IOPS required to provide a good user experience. Be sure the necessary storage capacity is allocated and the expected number of IOPS is provided in keeping with the design in order to provide a robust and responsive Exchange server infrastructure. 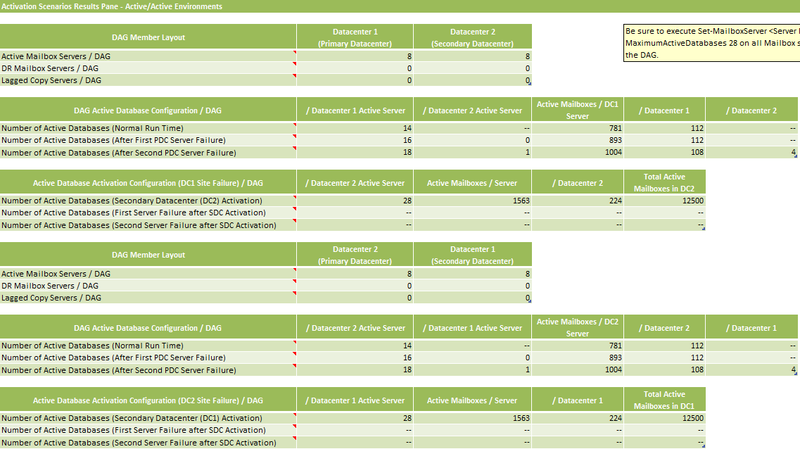 Activation Scenarios Results Pane – Single Datacenter and Active/Passive Environments. See “Single Datacenter and Active/Passive Environments” below. Activation Scenarios Results Pane – Active/Active Environments. See “Active/Active Environments” later in this article. This pane defines the activation scenario with the DAG in a single datacenter environment and in an active/passive environment, where the primary database copy is located in the primary datacenter and the passive copies reside in the secondary datacenter (see sample in Figure 4). DAG Member Layout High-level information about the number of active, DR, and LAG copy servers in the DAG at both the primary and secondary datacenters. Number of active databases in a normal scenario, with no server outage and databases distributed equally across all the servers in the DAG. Maximum mailboxes hosted on each mailbox server and database in the primary datacenter. Number of Active Databases (After First PDC Failure) = number of active databases in the primary datacenter after one mailbox server failure. Secondary Datacenter Database Activation Configuration/DAG DAG details about the number of active databases and number of mailboxes hosting on each server in the secondary datacenter when the primary datacenter failed and the secondary datacenter is active. The information shown in this section depends on the site-resiliency distribution model selected in the input sheet (see sample in Figure 5). If Active/Active (single DAG) is selected, the design has active copy and one passive copy located at the primary datacenter, and other passive copies at the secondary datacenter. If Active/Active (multiple DAG) is selected, the design shows the number of DAGs in the primary datacenter that have active and passive copies at datacenter 1, and passive copies at datacenter 2. Similarly, other sets of DAGs have active copies at datacenter 2 and passive copies at datacenter 1.